The Waterfalls and Lake are now open for the season. The Pueblo of Nambé, home to one of the most spectacular natural waterfalls in the southwest, is situated in the foothills of the Sangre de Cristo Mountains, and encompasses nearly 20,000 acres of high desert landscape. Nambe, originally “Nanbe”, meaning round earth, is one of six Tewa-speaking pueblos of Northern New Mexico. In 1976, as part of the San Juan Chama project, a dam was built above the falls to supply irrigation water to the Pojoaque Valley. 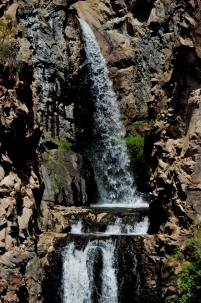 Shortly thereafter, the Pueblo opened the Nambé Falls Recreation Area to visitors for camping, hiking and fishing. Always carry drinking water, as temperatures in the summer are often high. The Ranger Station has water, soda, snacks and ice for sale. Two trails, each ~ ¼ mile, lead to the waterfalls from the Ramada Area. One trail climbs up the hill ending in a spectacular view of the waterfalls from above, while the other trail goes along and through the river winding up at a beach area at the lowest pool. If you take the low trail, expect to get wet and remember the river height fluctuates according to season. Wearing water shoes, shorts and carrying a pack to hold your belongings are all recommended. Pets are always welcome as long as they are leashed at all times and their owners clean up after them. *Please note that all watercraft fees are in addition to daily fishing and/or entree fees. All persons on watercraft must have a life vest on at all times. We do not rent watercraft, you must bring your own. Days of operation are Thursday – Sunday Hours of operation are 7:00am – 7:00pm. This year we are implementing kayak rentals at the lake. The kayak rental fees would be on top of the Daily Admission Fee of $15 per vehicle. Everyone who’s going to use a kayak must sign Release form (including those that bring their own). 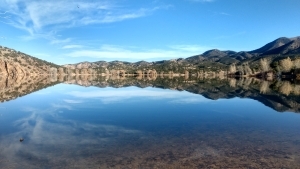 For campsite reservations, group sales and special events, and information please call (505) 455-2304. Don’t forget to visit us on Facebook @ NAMBE Pueblo Rangers. Nambé Falls and/or Nambé Pueblo are not responsible for accidents, damage or theft to personal property.